For this feature we turn the spotlight on to Sarah Jane Head (Or Scarey to her friends) and OPM Racing. Sarah Jane came in to the sport via the Straightliners series. 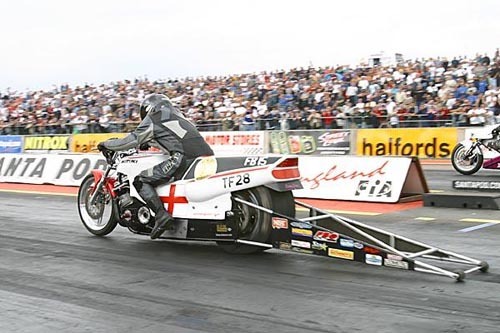 From there the team spent several years running a turbo bike in the Comp Bike class before her and her partner Dave took a step up to Funny Bike earlier this year with the purchase from Chris Hannam of the ex MRE Pro Mod bike known as "the Budster". After several meetings to let the team and rider get used to the new set-up they started to turn up the tune-up and it all came good for them in spectacular fashion at the UK National Finals when the final qualifier, in the dark on Saturday, saw Sarah Jane become the quickest and fastest female drag bike racer in Europe and second quickest in the world with a 7.08/184 run. Thanks to Scarey for taking the time to complete this feature for us. Sarah Jane: My partner Dave and I live in Selby, Yorkshire. As well as the racing, we both still have our road bikes and try to get out on them as much as possible and of course we try and get in our local pub as much as possible too! Sarah Jane: That would have been a Straightliners event at Elvington during 1994. 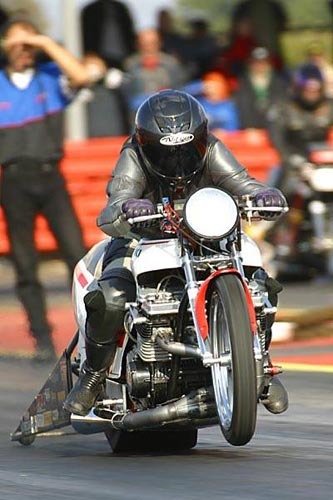 Sarah Jane: The first time I ran on the strip was at the Bulldog Bash, 1997. The first time I took part in a National Event was 2000. 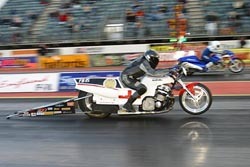 Sarah Jane: A 1500cc Suzuki GSX based Pro Mod Bike. Sarah Jane: Jay Regan at MRE. Sarah Jane: 1500cc Suzuki built by Jay Regan. Sarah Jane: 230 bhp without nitrous, lots more with it! Sarah Jane: As we haven't had the bike that long we have not really spent any time developing it yet, it's more been getting me used to riding the bike and Dave used to tuning it as it is very different from the old turbo bike. There is still more to come from the bike as it is currently. Once we have got the maximum out of the settings we have then we will look at developing it. 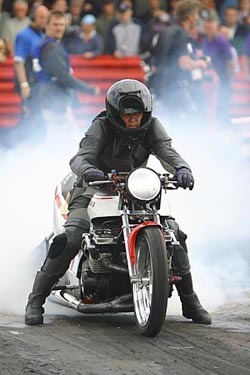 Sarah Jane: To take the bike into the six-second zone and become the quickest and fastest female drag bike racer on the planet! Sarah Jane: Obviously running that 7.085 in the dark, we had been sneaking up on it but that run took over a second off my personal best time on the bike and shocked a lot of people. Sarah Jane: It's a friendly sport and great fun! Sarah Jane: Paul Rose, if he can help you out he will. And to Tim Blakemore for putting up with Paul all the time! Sarah Jane: We don't have any sponsors to thank unfortunately, but big thanks do go out to Chris Hope and his team for all the help and advice, Lynn Hope for carrying nitrous bottles and pulling the starter cart around, Steve French and Chris Hall for help with the nitrous, Tim Blakemore and his team, Neil Midgley and his team and of course Cannon for selling us the bike! There are others that have helped us get to where we are now, I haven't mentioned everyone, but you know who you are. Thanks.